If you have excess funds in your General Fund, you can request those funds to be returned by withdrawing funds. 3. Click the "Withdraw Funds" link. 5. Chose where to send the payment and how much to send. If you need to use a different address, please see the "Adding and Verifying Emails to Which We Can Send" section below. 6. Continue and you are done. 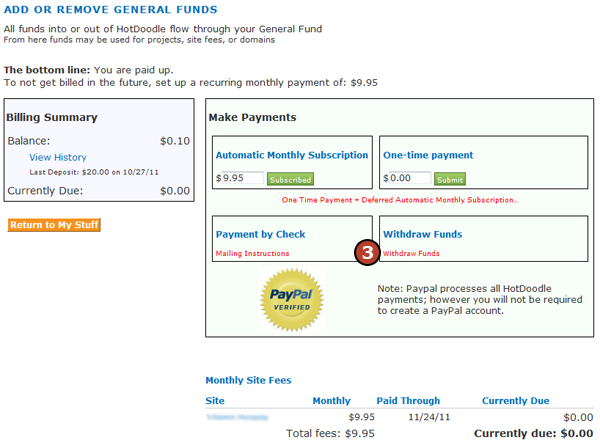 The two basic ways to get funds to you are to reverse a prior charge and to send money. We generally attempt to reverse payments when we can. Most payments made within the last 60 days can be reversed, but the exact rules are set by the various banks and credit card companies. When refunds cannot be made by reversing payments you made we can make a PayPal payment to an email address of your choice. You have the option of a withdrawal that will happen only by reversing payments, up to the requested amount. We will not send to an email address to which we have not verified you have access. If we have received funds from an email address we consider that address to have been verified. Otherwise you may verify a single other active email address. Use the flow below if you need to add and confirm a different email address to which to send the funds. These steps are needed because HotDoodle wants to be sure that the funds are sent to where the owner can get them. Without the confirmation a small typo could irrevocably send the funds to a stranger. To use a new address, enter it as "a different account"
You may have only one payee email address other than addresses from which we have received funds. HotDoodle needs to know that this email address works for you, so we will send an email to that address with a link that must be clicked. The screen you see after entering a new email address explains this and that you will need to supply your HotDoodle username and password when you click on the link. Here is an email sent to the new address. The confirmation is important because if you cannot receive this email, then you would not have received the emails about the refund. Do not worry in case you gave a bad email address. We will not send your funds to a lucky stranger. Whom ever receives this email will have to log into HotDoodle before we accept the confirmation. It complicates the flow, but protects your funds. Click on the "Confirm this address" link. 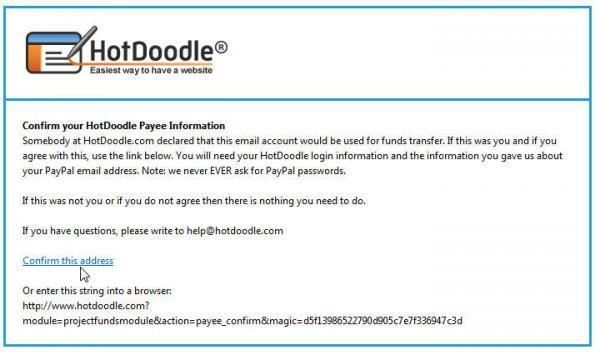 Clicking the link in the email opens a form that needs your HotDoodle login information and the email address you used. This confirms that the right person got the email. If you normally log into HotDoodle by other means, such as a login link, then you can use that and then click the link in the email. If you are already logged in the form will not ask for your HotDoodle username or password. 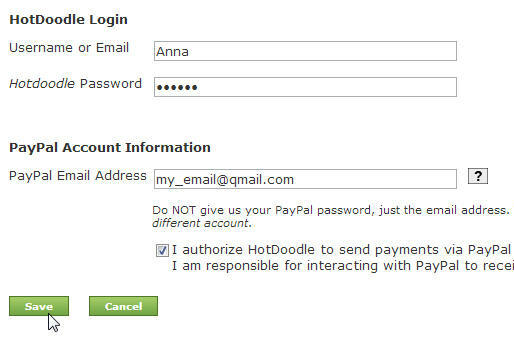 Note that we are asking for the HotDoodle password -- we never ever want to know your PayPal password. Filling in the form confirms the email address. You need to click "Withdraw Funds" to request the amount.